Blockchain and Its Retail Potential - New West Technologies, Inc. 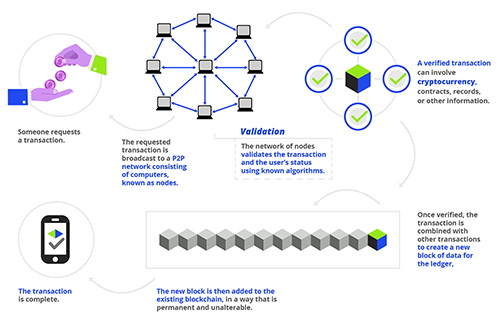 The blockchain is a way of digitally recording data and transactions, allowing digital information to be distributed but not copied. Mostly known and originally devised for its ties to Bitcoin, blockchain has an intriguing past under the cover of cryptocurrency transactions. The tech community is now finding other potential uses for this technology. As a distributed or peer-to-peer ledger technology, the information held on a blockchain exists as a shared—and continually reconciled—database. Information is shared across different computers in a network making it difficult to hack, but also allowing the immutable records as public knowledge, easily verifiable and easy to access in real time. The potential applications for blockchain technology wander far outside the scope of cryptocurrencies. For retailers paying attention, many opportunities to apply the emerging blockchain technology in their world are presenting themselves right now. There is an obvious benefit that can be found in using blockchain in payments of course, but also supply chain, inventory, customer transactions, and more. Solving problems of legitimacy and pedigree of products often counterfeited like Rolex watches or high-end apparel, retailers could invoke blockchain technology for more advanced inventory tracking of these items. Solid blockchain tracking methods would make it possible to prove every movement along a product’s lifecycle through every legitimate touch from manufacturer to supplier to shipper, before, during and past the sale and into the return and warranty periods. Now is the time for retailers to watch and learn about this powerful technology. It can and will be used to make transactions more verifiable and information more trusted, helping eliminate workflow and processes often in place to ensure the accuracy of information produced by current systems. This will ultimately save time, money and improve customer service. Many of the potential retail applications for blockchain technology do not yet exist or are in infancy, but there is a great potential that could increase transparency and security across the retail sector from high-end retail to food supply and resale markets. Keep your eye on blockchain technology and learn more about it today! Dan King is the President of New West Technologies, Inc. With over 30 years of point of sale technology experience, his passion is helping retailers find the right software, hardware and technical assistance to make their businesses thrive.